"I found this article to be extreamly helpful. 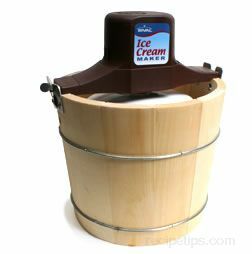 I was very happy that someone ... read full review"
When making homemade ice cream, be aware that there is the risk of being infected with Salmonella Enteritidis, a strain of Salmonella. The risk comes when the ice cream has eggs as one of its ingredients. Salmonella is found in raw eggs and can cause Salmonella Enteritidis, which causes fever, diarrhea and abdominal pains. 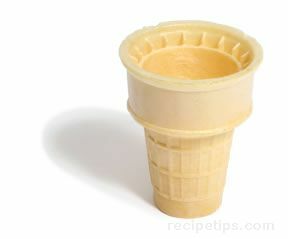 Most recipes that include eggs are the custard style ice cream and the eggs are cooked in the custard making process. If brought to a temperature of at least 160°F, the threat of being infected by the Salmonella would be eliminated. The Salmonella is killed at a temperature of 160°F. Another way of eliminating the risk of being infected by Salmonella is to use an egg substitute, a pasteurized egg product or pasteurized shell eggs rather than regular eggs. Also, be sure that the milk and cream are pasteurized. Properly clean and maintain all the equipment and the ice cream maker according to the manufacturer's instructions before starting. 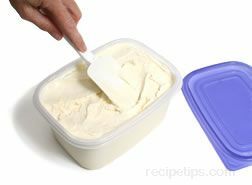 When storing homemade ice cream, make sure it is placed in a container with a tightly sealed cover. Be sure there is at least 1/2 inch headspace in the container to allow for expansion. It is best to store the ice cream in a freezer unit rather than in the freezer section of a refrigerator because the freezer section in a refrigerator does not get as cold and does not maintain a consistent temperature. The colder the temperature is the faster the ice cream will freeze. If a freezer unit is not available, be sure to place the ice cream in the main freezer section of the refrigerator. Do not store it in the door of the freezer section. 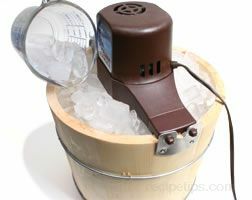 If stored in an airtight container at proper temperatures, the ice cream can be stored for a fairly long period of time. 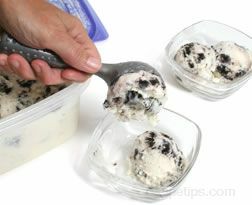 Do not allow the ice cream to sit out in room temperature for very long. This will help prevent it from melting. Partially thawed ice cream should not be placed back in the freezer. Any ice cream that contains raw eggs should be eaten within a week. To keep ice crystals from forming on leftover ice cream, place a piece of plastic wrap over the surface of the ice cream and press it down with your hands so the entire surface is covered. "I found this article to be extreamly helpful. I was very happy that someone cares about passing on safe ways to store ice cream."